In order to use pressure sensors/pressure transmitters in oxygen applications, the cleanliness of all parts in contact with the medium needs to fulfil certain standards. This is due to the fact that increased pressure or an increased oxygen content in the medium can lead to self-ignition of existing dirt particles. Various worldwide standardisation organisations have tackled this problem and set up purity standards for medical instruments. The most important standards for this section are ASTM G93 level C, D, E and ISO 15001. Model MG-1 pressure sensors or pressure transmitters meet the stated familiar standards for cleanliness and are ideally suited for use in oxygen applications. In order to find the right pressure sensor/pressure transmitter for your application, you need to determine the specification of the pressure sensor itself and additionally the required level of cleanliness. The most important question in this case is: Which amount of residual hydrocarbons does your application allow? The amount of hydrocarbons is measured in mg/m². Common amounts are 1000 mg/m² for applications in industrial surroundings or 220 mg/m² for applications which require compliance with ISO 15001. Choosing a packaging of the pressure sensor that’s adjusted to the cleanliness of your own production environment is just as important – if producing in a clean room, a double sealed packaging bag is recommended, in standard industrial environments a protection cap on the pressure connection of the pressure sensor is usually sufficient. 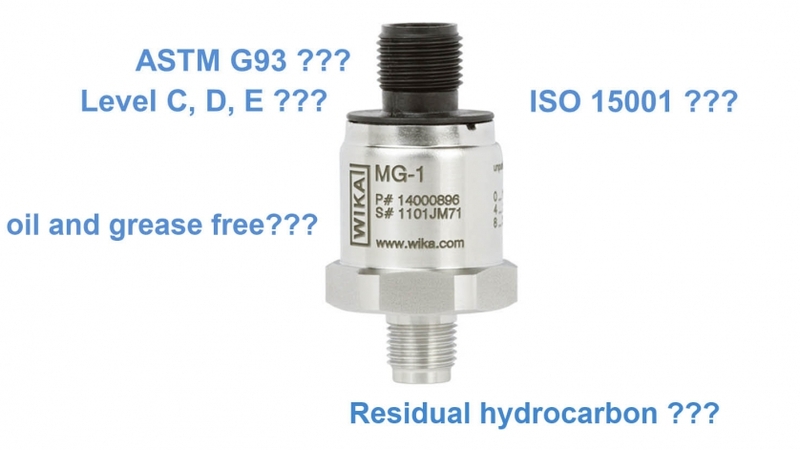 Should you have further questions or if you need a detailed application consulting for WIKA’s pressure transmitters, simply use our contact form.